Contest #1 – Make Yourself a Sci-Fi Character! Announcing the first ever Galaxis contest! Make yourself into a your favorite Science Fiction Character. Take a picture of yourself, or edit a picture of yourself, and send it in. All pictures will be subject to a vote and the winner will receive a copy of the ORIGINAL Manuscript! 1) ENTRY: Contest is open to anyone and everyone. Enter your pictures by sending to the Galaxis Book Page in a private message (link to Facebook page is at the top of this blog page). Pictures must be submitted by 8 P.M. EDT, Friday, 6 October, 2017. The picture must be of the individual submitting it. Submitting pictures of other people is not permitted. 2) JUDGING: Pictures will be placed in an album on the Galaxis Facebook Page. The album will be open for viewing/judging from 12:01 A.M through 11:29 P.M. Saturday, 7 October, 2017. Pictures will be judged by the Facebook community. Members will “vote” for their favorite picture by liking or reacting to it (any like or reaction to the photo will count as a vote for that picture). Only one vote per person is permitted. 3) VOTER ELIGIBILITY: Anybody may vote for any picture that is posted. As mentioned above, only one vote per person is permitted. If an individual votes for more than one picture, all votes from that individual will be disqualified from scoring. 4) SOLICITING VOTES: Contest participants may use any means and any platform to solicit votes for their individual picture. They may share the picture on any social media outlet as many times as they wish. The only limit is your imagination. 5) SCORING: There will be two tiers to the scoring. Tier 1 encompasses those who like Galaxis Book page. Tier 1 votes will be worth 5 points. Tier 2 encompasses everybody else. Tier 2 votes will be worth 3 points. The final score for each picture will be the totals between the two tiers. 6) PRIZE: The prize will go to the individual in the picture with the highest score. 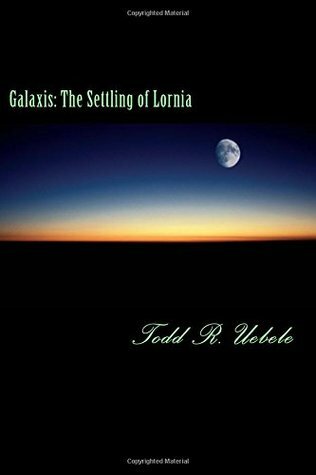 Winner has the choice of receiving an electronic copy or a printed copy of the ORIGINAL Manuscript of “Galaxis: The Settling of Lorning.” The original manuscript is roughly 1/3 to 1/2 the size of the released book. 7) QUESTIONS: Questions may be submitted by commenting either on the blog post or on the Facebook post, OR by sending the Galaxis Book page a private message. Please note that questions sent via private message will be posted (along with the answer) on the page so that everyone may have a fair shot. Author ToddPosted on September 24, 2017 September 28, 2017 Categories ContestLeave a comment on Contest #1 – Make Yourself a Sci-Fi Character!